Nook Logan, of the Erie SeaWolves, hitting a foul ball during a game against the Reading Phillies on July 2, 2006. 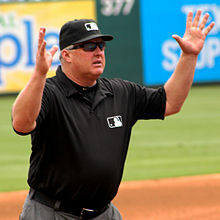 While on or over foul territory, touches the person of an umpire or player, or any object foreign to the natural ground. By interpretation, a batted ball that touches a batter while in his batter's box is foul regardless of whether it is over foul territory. A foul fly shall be judged according to the relative position of the ball and the foul line, including the foul pole, and not as to whether the fielder is on foul or fair territory at the time he touches the ball. Additionally, ballpark ground rules may specify that batted balls striking certain fixed objects such as railings, nets, or a roof if present are foul balls. Foul territory or foul ground is defined as that part of the playing field outside the first and third base lines extended to the fence and perpendicularly upwards. Note: the foul lines and foul poles are not part of foul territory. In general, when a batted ball is ruled a foul ball, the ball is dead, all runners must return to their time-of-pitch base without liability to be put out, and the batter returns to home plate to continue his turn at bat. A strike is issued for the batter if he had fewer than two strikes. If the batter already has two strikes against him when he hits a foul ball, a strike is not issued unless the ball was bunted to become a foul ball, in which case a third strike is issued and a strikeout recorded for the batter and pitcher. A strike is, however, recorded for the pitcher for every foul ball the batter hits, regardless of the count. If any member of the fielding team catches a foul ball before it touches the ground or lands outside the field perimeter, the batter is out. However, the caught ball is in play and base runners may attempt to advance. A foul ball is different from a foul tip, in which the ball makes contact with the bat, travels directly to the catcher's hands, and is caught. In this case, the ball remains live and a strike is added to the batter's count. If a foul tip is strike three, the batter is out. On rare occasions, such as in extra innings or the ninth inning of a tie game when a runner is on third base, with less than two outs, fielders have been known to let long foul flies drop rather than risk losing the game on a sacrifice fly. Sometimes, in that situation, a fielder will not try to catch a ball that is close to the foul line in the hope that the ball will go foul at the last second. In different situations, a foul ball may be considered a positive or negative outcome of a pitch or swing. When there are zero or one strikes, a foul ball counts as a strike, benefiting the pitcher. However, a foul ball may reveal to the batter that he has timed a pitch well and need only make adjustment to the location of his swing on the next such pitch; this is often called a good cut or simply a good swing. Foul balls with two strikes are generally considered positive for the batter, since he thus avoids strike three on a potentially difficult pitch. Also, foul balls with two strikes increase the pitcher's pitch count, adding to his/her fatigue, thus providing some small advantage to the offense. 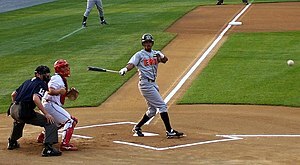 A strategy of swinging on any ball to try to produce additional fouls and prolong an at-bat is often used against strong pitchers to try to drive them from the game sooner (and also the possibility of the pitcher throwing a pitch a hitter can get a hit on); this does, however, have the disadvantage of generating more strikeouts. ^ "Rule 2.00. Definition of terms" (PDF). Major League Baseball. Retrieved 2009-06-13. ^ a b "Official Baseball Rules" (PDF) (2018 ed.). Major League Baseball. Retrieved 2018-09-25.